I know I try to eat more healthy, but getting that daily cup of cruciferous is easier said then done. According to the National Cancer Institute, compounds in cruciferous veggies inhibit tumor blood vessel formation (angiogenesis) and tumor cell migration (needed for metastasis). That’s very motivating to know, yet it’s so easy to pass up the bok choy or broccoli when I have a bag of blue organic non-gmo chips just waiting to be ripped open and dipped into my favorite salsa. I admit I am a snacker and love all things dippable that I can eat using my fingers. In my case its best to prepare food ahead of time and stick it in the fridge, so when I have my daily snack attack it’s ready to go and I get a very nutritious, fresh, chock full of enzyme snack. 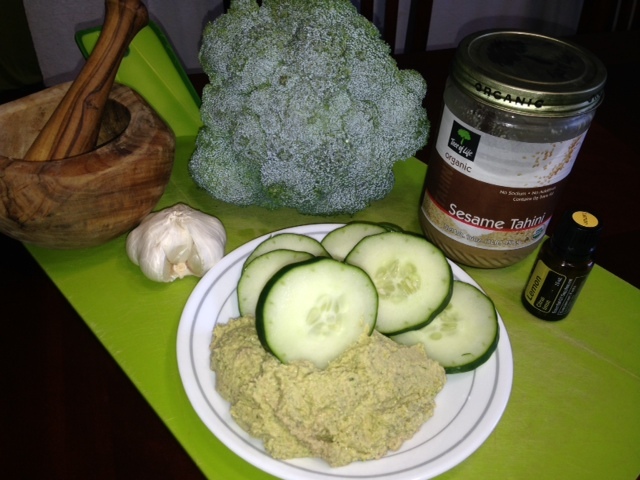 The recipe below is my favorite Broccoli-Hummus. Beware it’s very green and not for the faint hearted. 1.Wash the broccoli, chop into little pieces and put into a blender (A K-Tec or Vitamix would be best if you don’t have a high-speed blender you just have to spend more time blending.) 2. Add the remaining ingredients except flax oil. Blend all ingredients until smooth and then blend in flax oil at the end. 2. If you want a creamier consistency, you can always blend in an avocado. Once blended eat with cucumber and celery slices or red pepper. This makes a great snack, and it’s healthy too! Next Post Why bother with Organic? Is there something we can use if we don’t have the lemon essential oil? You can omit the essential oil if you don’t have it. The oil intensifies the flavor.